It doesn't mention Norway at all, it mentions Swedish LEGO sales starting in 1955, and in 1959 LEGO Sweden was established (??) and also in 1959 LEGO Finland was established. 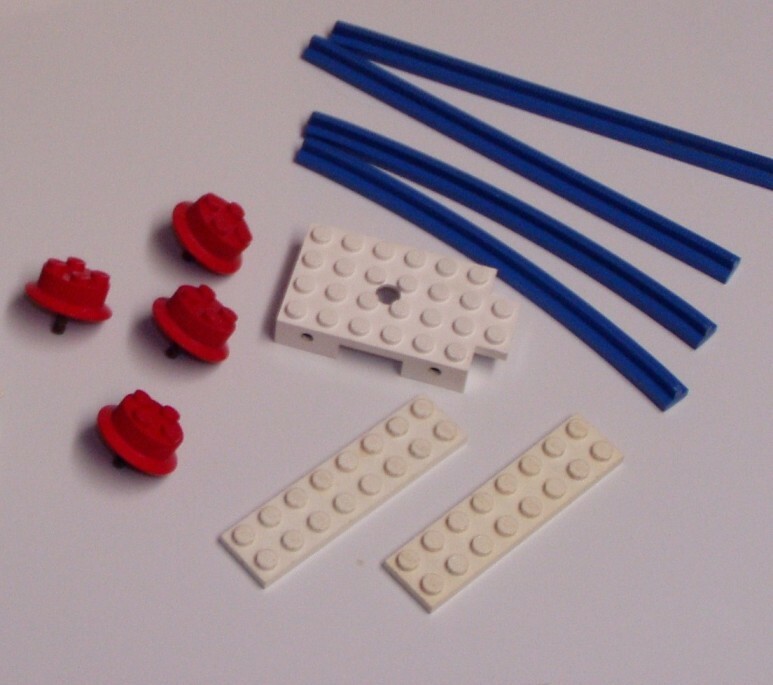 The first LEGO sets started selling in Denmark in 1949 as Automatic Binding Bricks. 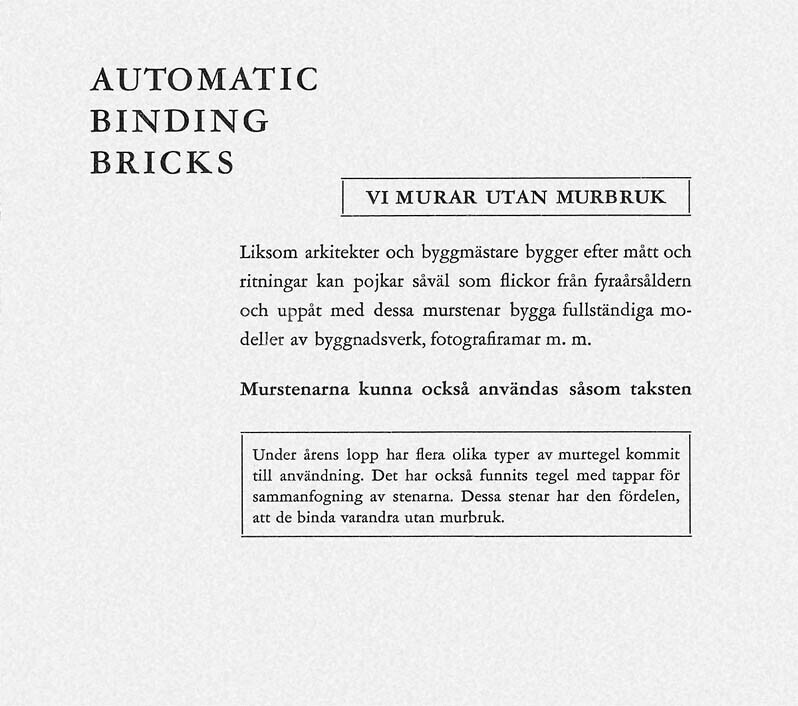 Then in 1950 Automatic Binding Bricks were also selling in southern Sweden... but not produced from Denmark... but produced by a company called Geas Konstharts of Gisvaled Sweden. 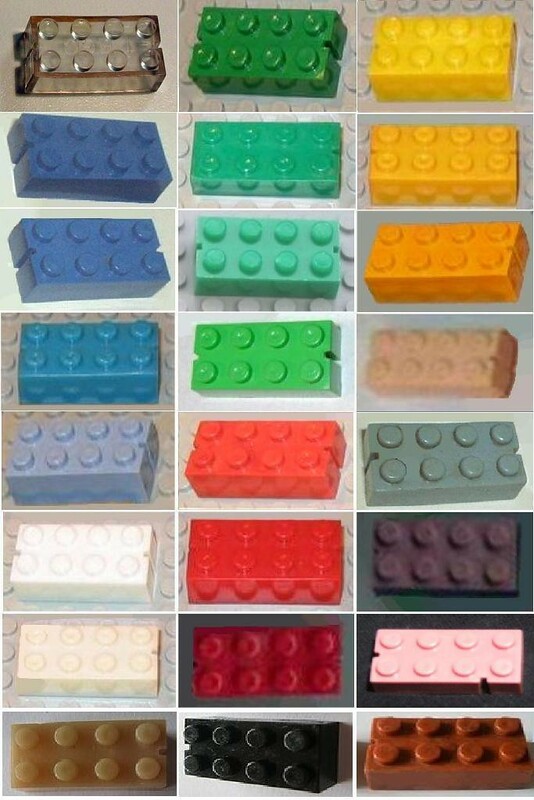 These first non-Danish LEGO bricks were rather odd... they were not made of Cellulose Acetate (the plastic that was used by TLG from 1949-63)... but of Polystyrene... a shiny plastic. 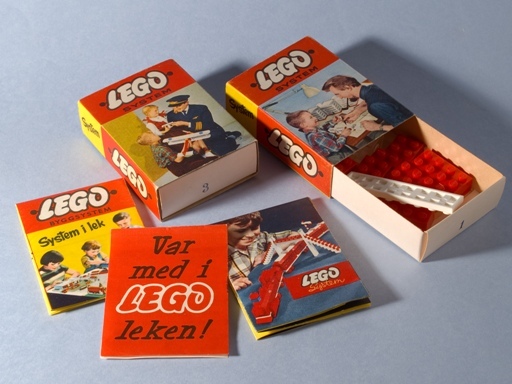 These first Swedish sets had the same Automatic Binding Bricks boxes as those of Denmark. The only way to tell the difference was the brochure, or the bricks themselves... but not the box. 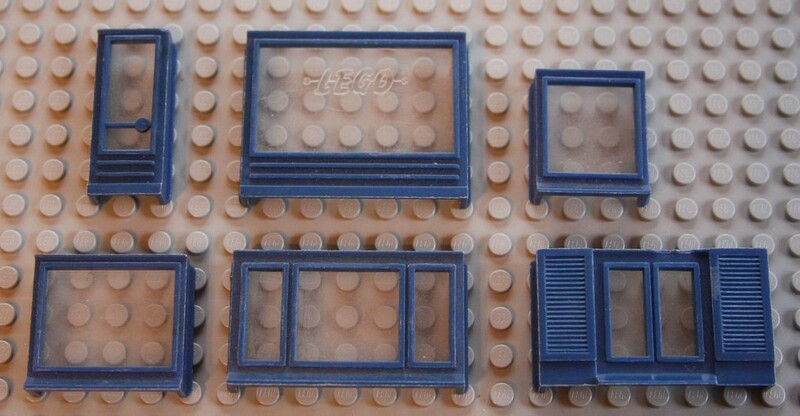 This is the oldest known building ideas image of LEGO parts, and dates to about 1950. The Geas Konsthart's brochure does NOT mention the word LEGO or Billund at all, which is unusual. 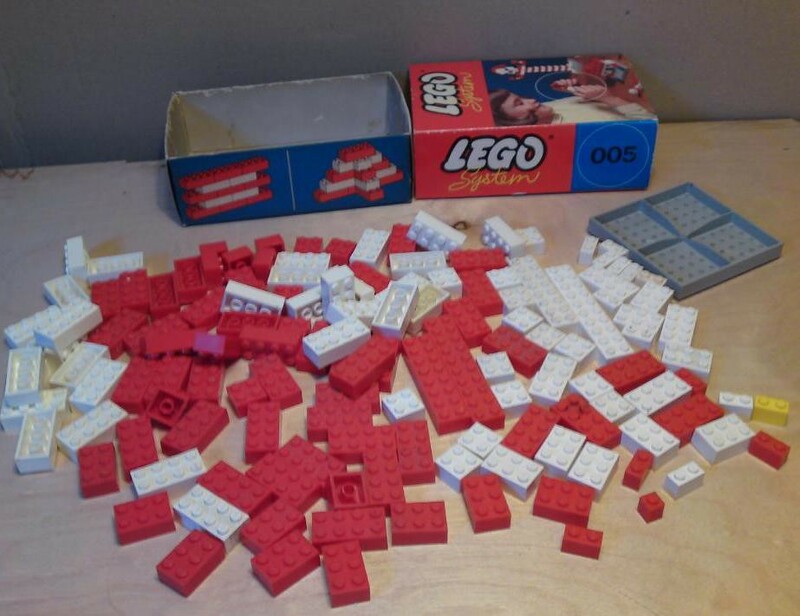 An acquaintance contacted the still in production Swedish plastics firm a few years back... and they have no records of making LEGO at all. 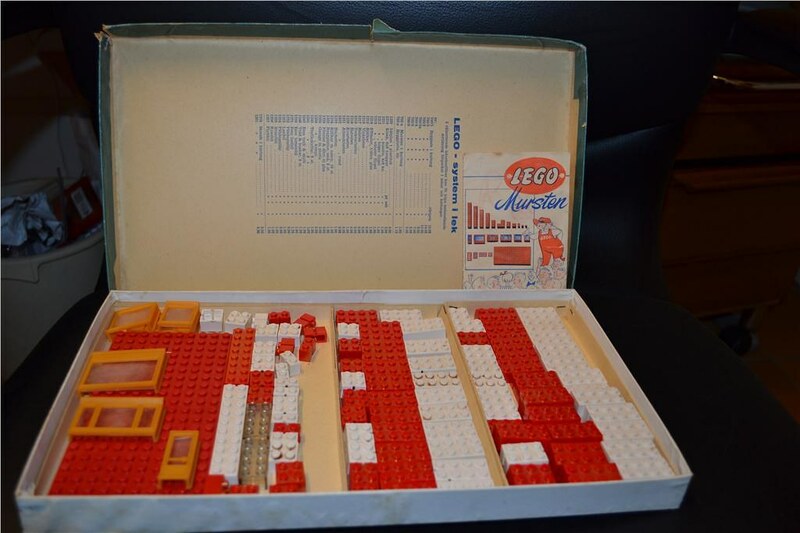 The production of these strange sets (mentioned in Chapter 2 of my LEGO DVD/E-Book Download) is still a mystery today, since the Billund LEGO Archives also have no info on these early Swedish sets. 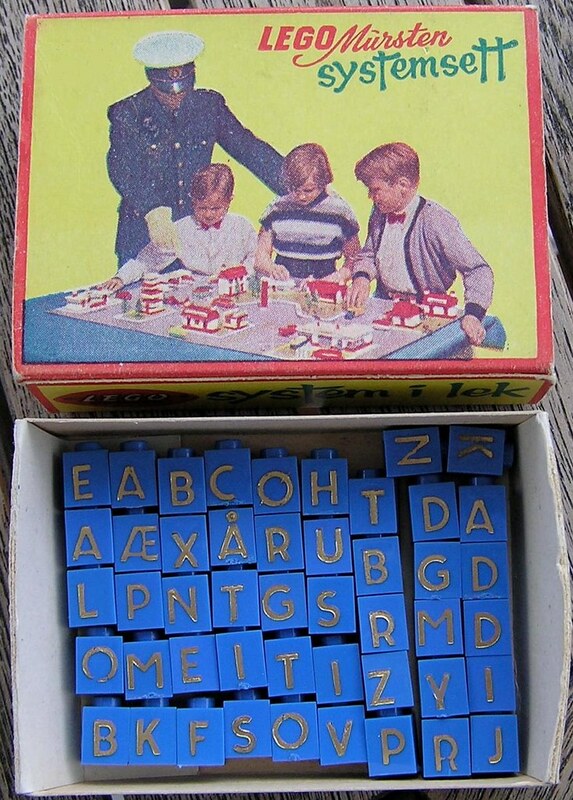 These sets were not popular in Sweden, and were discontinued within a year. 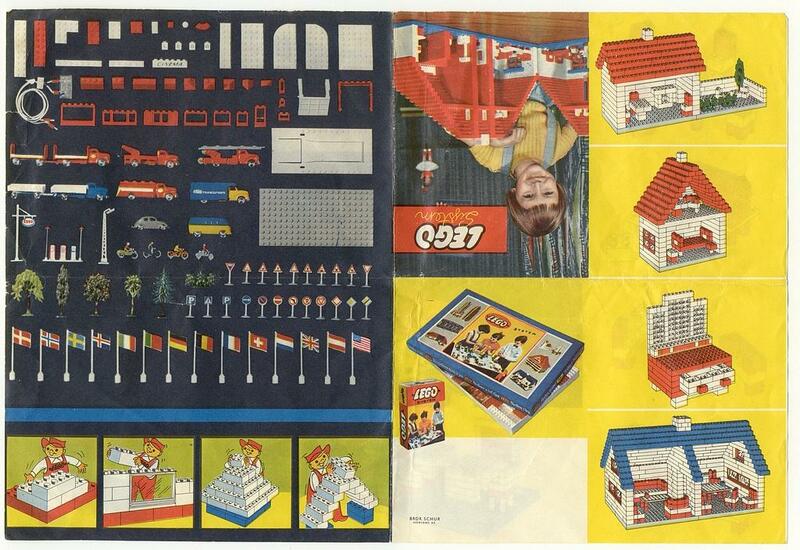 Then in 1953 Ole Kirk Christiansen, who did some of his early carpentry apprenticeship in Norway (and married a Norwegian) thru one of his Oslo Norway contacts, got LEGO sales started in Norway. However due to toy import restrictions in Norway in the 1950s, he had to have a Norwegian company produced the parts and sell the LEGO sets there. 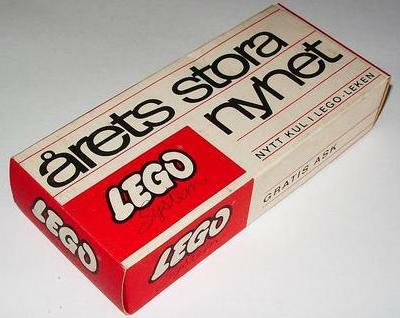 This company was called Svein Strømberg & Co., which under the name A/S LEGO (later changed to A/S LEGIO) produced the first LEGO sets in Norway starting in 1953. 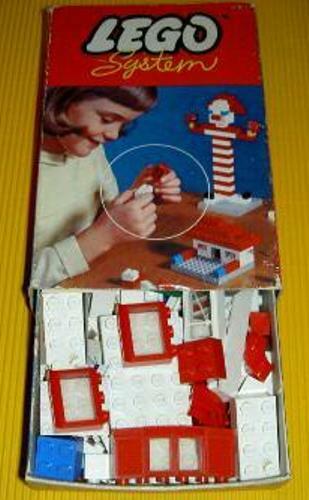 There were 3 basic sets, 2 parts packs sold from Norway that year. 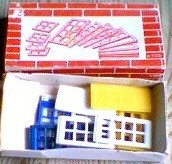 There was also a wooden retailer box where loose bricks, windows/doors and baseplates could be purchased (an early PAB). And finally we get to Finland.... the first LEGO sold in Finland was in 1959. Since there was a partial ban on toy imports in Finland as well as Norway... about 70% of all parts (mainly the non-specialty parts such as bricks) were produced in Finland, with the more complex parts imported from Denmark. The funny thing about Finland is that the first LEGO there was produced by a businessman by the name of Boris Strömsholm in 1959 in a barn-like building!! By the early 1960s the toy import restrictions were eliminated in all Scandinavian countries, and production was moved to Billund Denmark. I have a lot of images of unique LEGO items produced in these countries in my 2,800 page LEGO download (E-Book), and that includes sets, parts in unusual colors (windows/doors in green in Norway, in yellow in Sweden), as well as unique boxes in the local languages. And one of my favorite topics is the switch in 1967 of Sweden's going from driving on the left to driving on the right (they had a few unique Town Plan boards with left driving roadways). Nice and detailed story, thanks for sharing! You are most welcome! Also, since you're from the Netherlands... 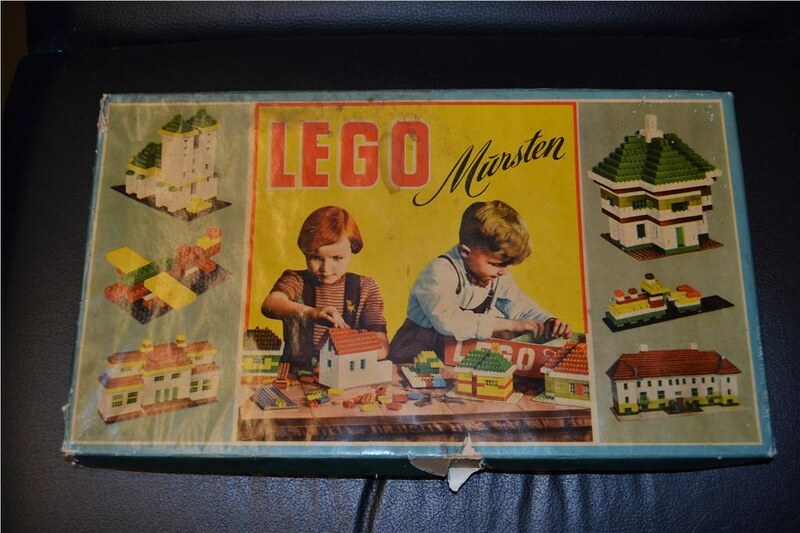 I've been told by TLG Archives folks that some 1950s and early 1960s LEGO sets/parts sold in the Netherlands were produced in Norway. I've never found a way to confirm or identify this. The one peculiarity that Norway and the Netherlands share is that the 271 Traffic Policeman set (1956-65) was only sold in the Netherlands, Norway and Denmark. I was mentioning Scandinavia.... and I forgot about Iceland!! 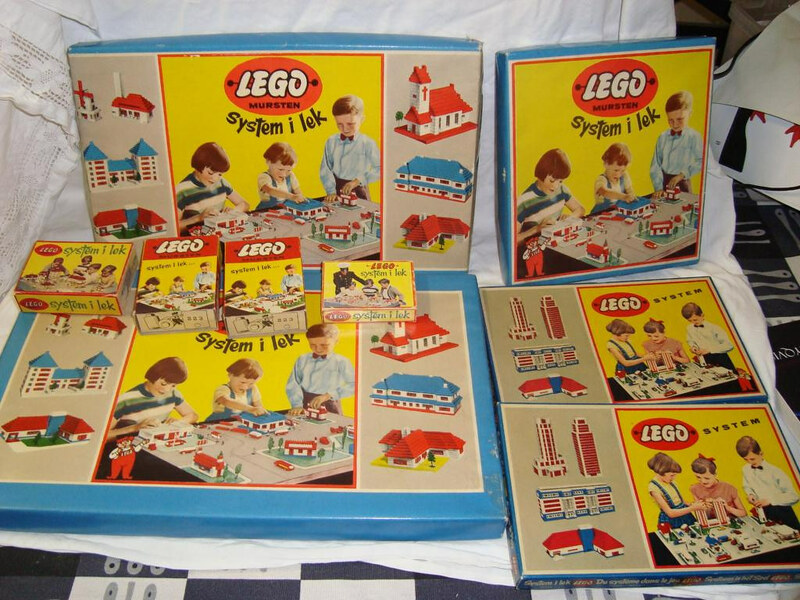 The first sets sold in Iceland were starting in 1955, but under a different brand name.... SIBS.... although by 1960 the sets did start using the LEGO name. And the parts were shipped to Iceland, where the sets were assembled by residents of a Tuberculosis Sanitarium called "Reykjalundur". 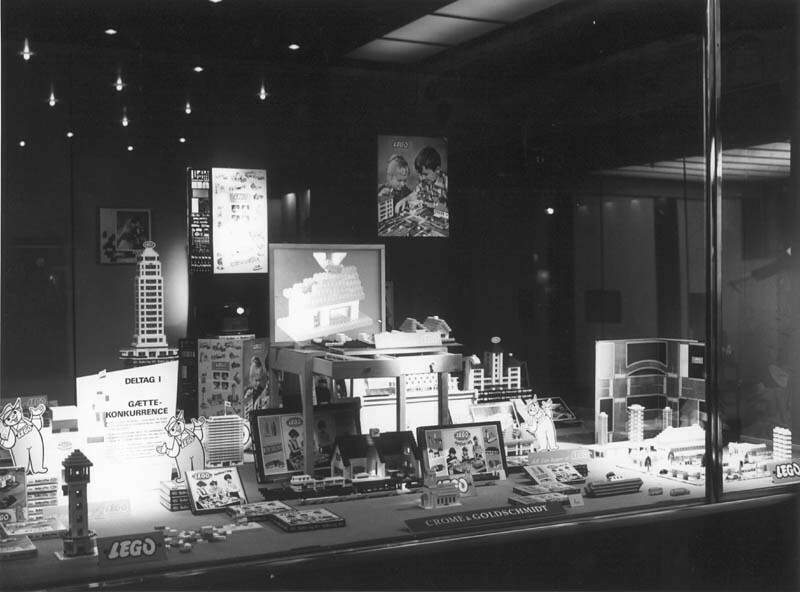 There's an entire chapter of my DVD download - "Chapter 73 - LEGO Sales/History By Country".... that shows old black/white images from the 1940s thru 1960s related to the history of LEGO. 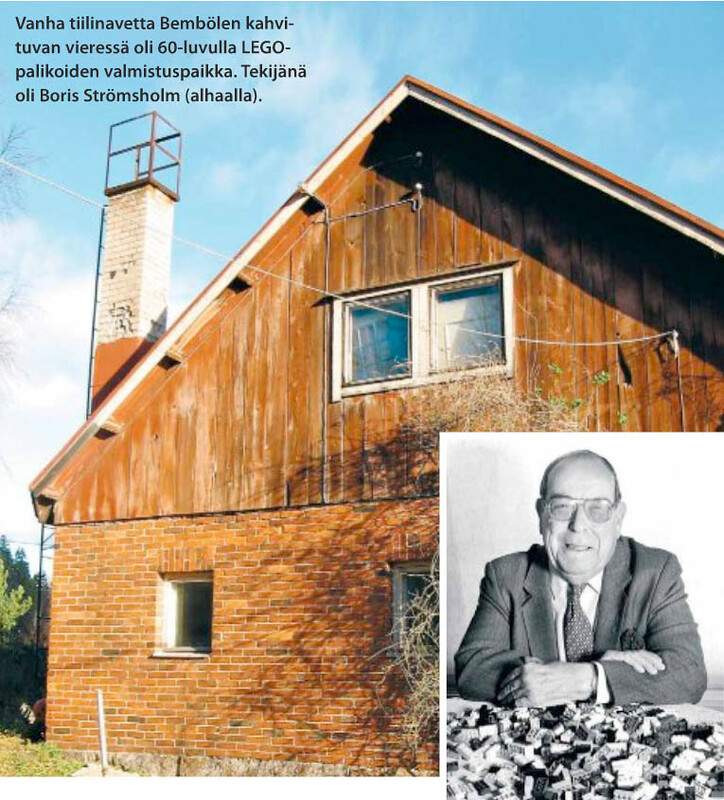 The funny thing about Finland is that the first LEGO there was produced by a businessman by the name of Boris Strömsholm in 1959 in a barn-like building! Funny, I've visited the nice and cosy cafeteria that's situated next to this building in Bemböle a few times in the past, but never knew about its history related to Lego. Wow... it is a small world!! Next time you go there.... take a photograph! 1) 1949-51 Danish and 1950-51 Swedish (Geas) box design (700/3 set). 2) 1951-52 Danish (lettering is different) box design (700/3 set). 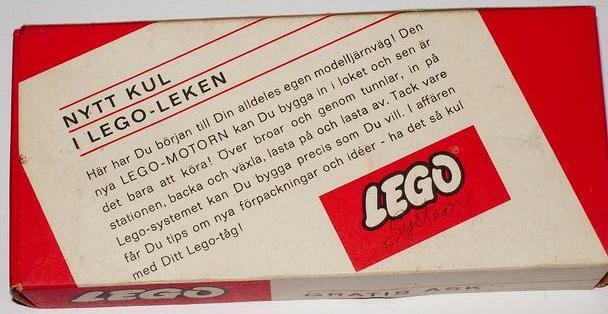 3) 1952-53 Danish (word "LEGO" added) box design (700/1 set). 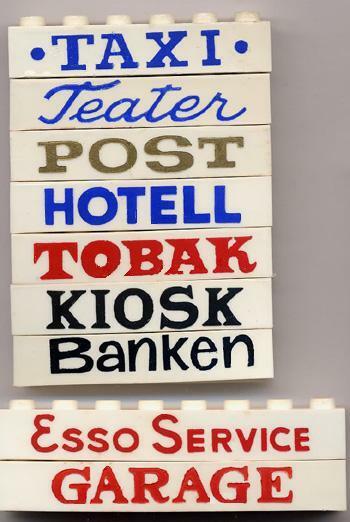 4) 1953-54 Norwegian (A/S Norske LEGO) box design (700/2 set). 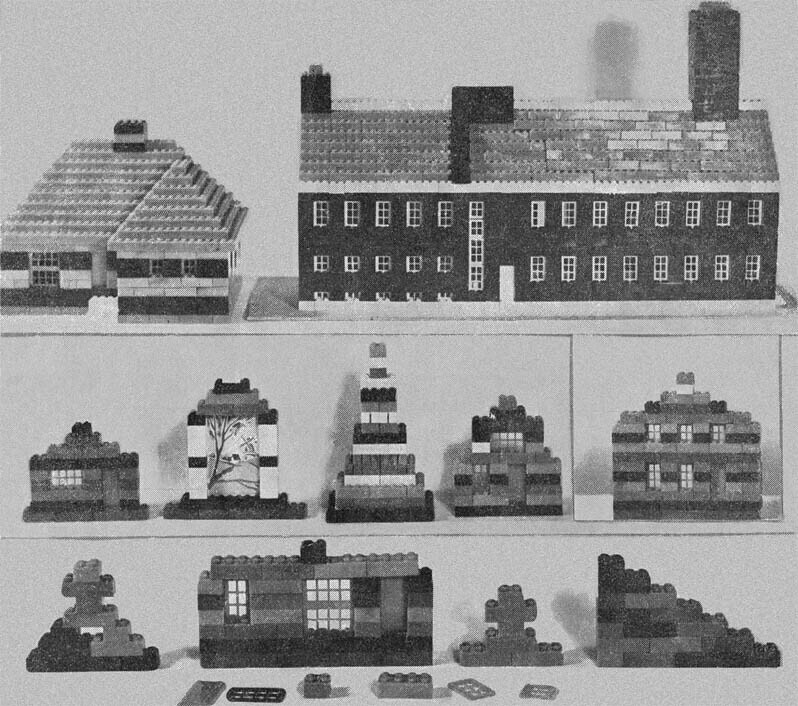 Images from "Chapter 2 - Automatic Binding Bricks (1949-54) of my LEGO DVD download E-Book. And.... starting in 1953 in Denmark, and 1955 in Norway and Sweden.... these are the box top designs for all the LEGO basic sets.... they no longer say Automatic Binding Bricks, but now say "LEGO Mursten".... with Mursten having the same meaning in all 3 languages (I won't say if it means bricks or blocks... because someone will tell me that it's a slightly different meaning in their language ). This is from my LEGO DVD download.... "Chapter 5 - LEGO Mursten & LEGO System Sets". This above image shows 4 colors being packed into the sets. 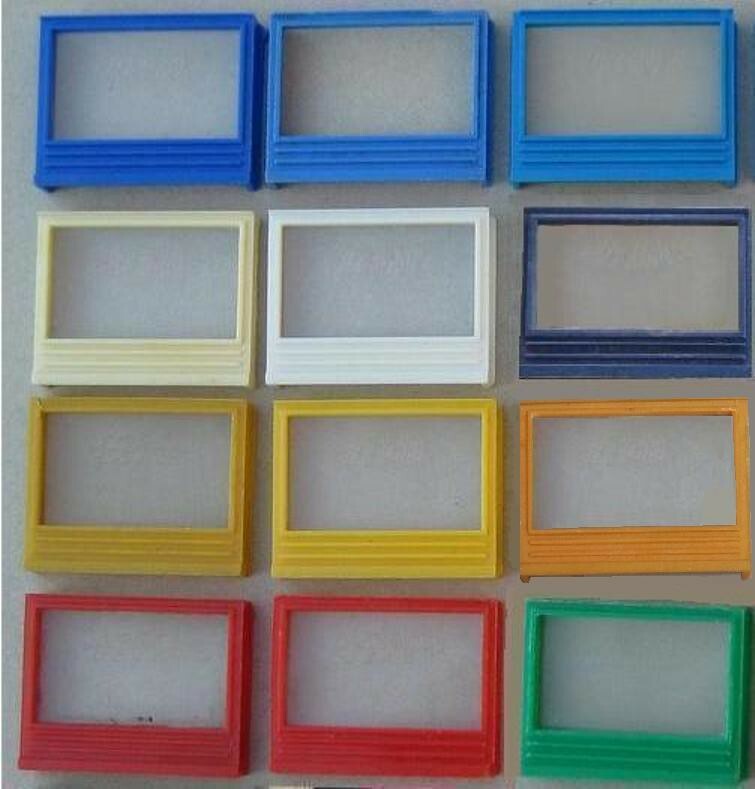 The 4 colors could vary... but often red, white, yellow and green were the colors. Starting in 1955 the colors switched to just 2 (red and white) as the packing below shows. 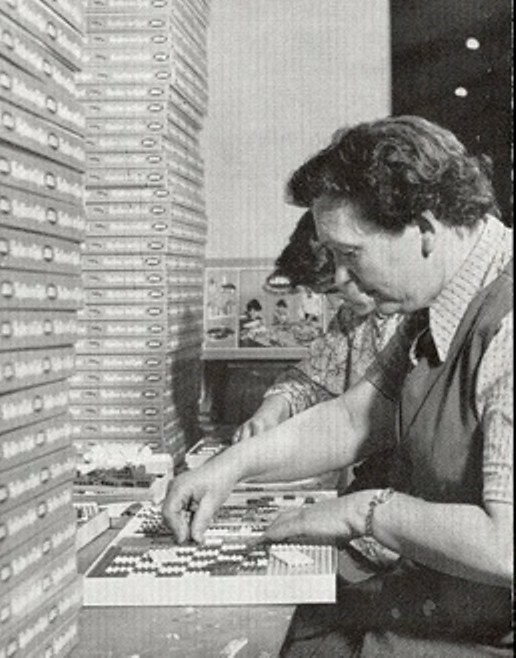 And this next picture is also from Chapter 5... it shows a worker at the LEGO factory in Billund hand packing these sets... My 2,800 page DVD download collectors guide has over 6,000 images... with many very historic LEGO images collected from LEGO folks around the world and from the Billund Archives/Collections/Vault! One of the interesting things about Finland is that a small percentage of the population speaks Swedish as their main language. So TLG made the Finnish catalogs Bilingual.... Finnish-Swedish. Here is a page of the 1966 catalog from Finland that shows all the text in both Finnish and Swedish. I got this from the TLG Archives, so I could get the image of the very rare Finland 710 Wooden Box Set. It was sold "with contents" and empty. Also still shown is the very rare continental European 810 Town Plan set (available since 1961) in some continental catalogs for the last time. 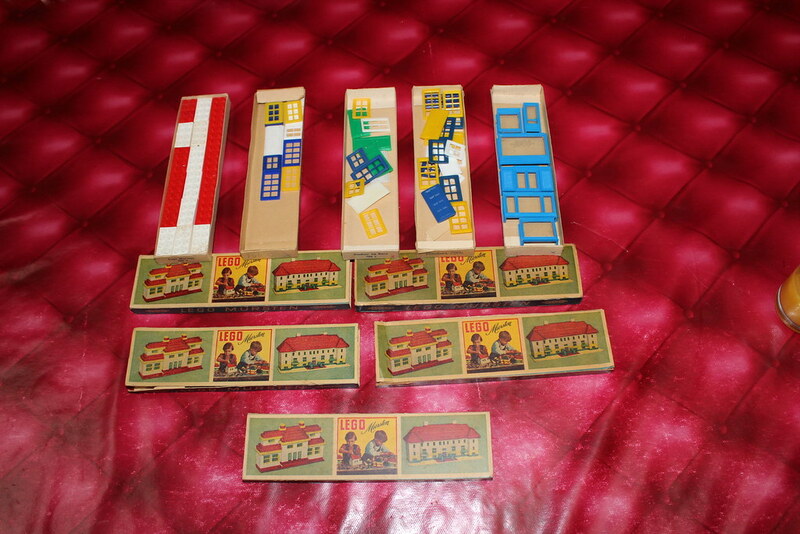 And the very interesting TERAPI I - II - III sets are shown (Terapia in Finnish). 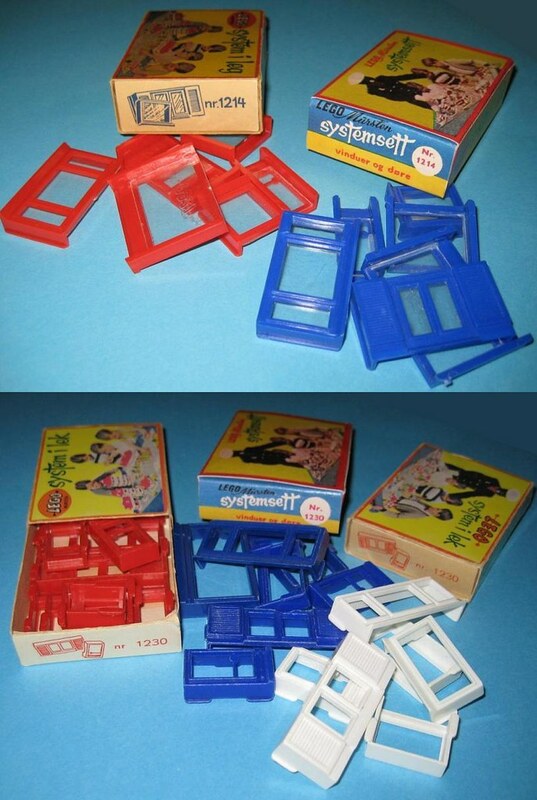 These were wooden box Educational sets (with a plain red sliding top), mainly for schools and kindergartens. 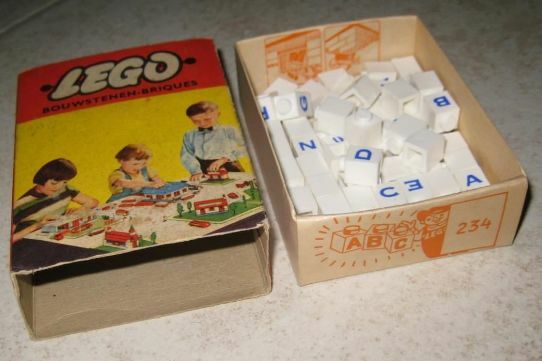 These were only sold in Denmark, Norway and Finland in the 1960s, but later became available in many continental European countries (and their LEGO catalogs) in the 1970s as Educational Sets 91, 92 and 93. 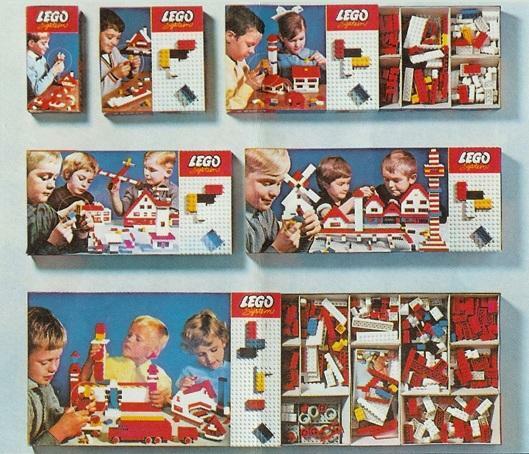 Those strange "TERAPI" Educational sets I just mentioned do show up in this 1965 Danish catalog image... at least the image of one of the sets does... with the red top. Also shown are all the new 005-010-020-030-040-050-060 basic sets. 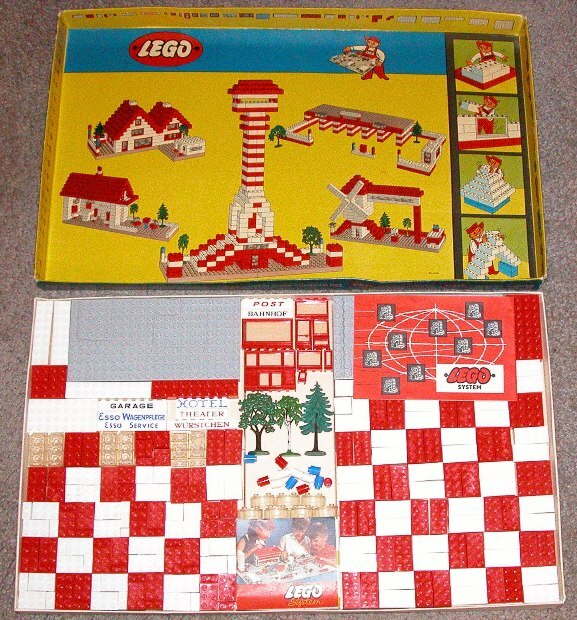 When these basic sets came out, it freed up a lot of TLG workers time that was previously spent on hand packing flat sets in checkerboard brick patterns (1949-65). 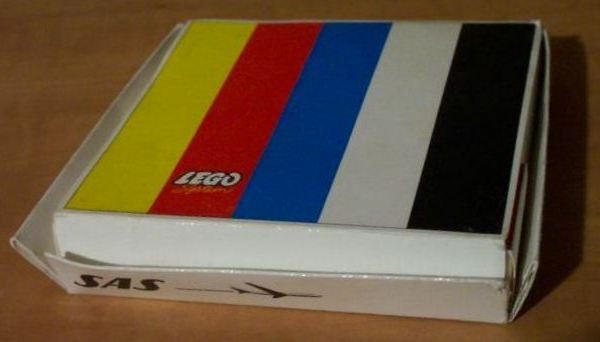 So now LEGO basic sets worldwide had loose LEGO parts packed inside the boxes, which now had paper or plastic compartments inside where the bricks were loosely stored. I'm not exactly sure when LEGO sets started to be packed by machine (instead of humans)... but loose box packing was a big step towards automation. 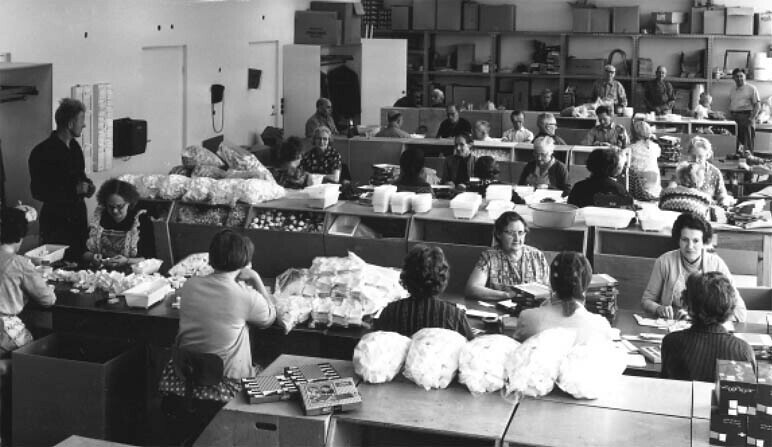 Spare parts packs had loose parts since 1955, but it was not until 1964 that the first model or basic sets had loose parts (except for wooden box and Town Plan sets which were always loose parts). On very rare smaller set was the 005 set of this same era as the 010-060 sets. 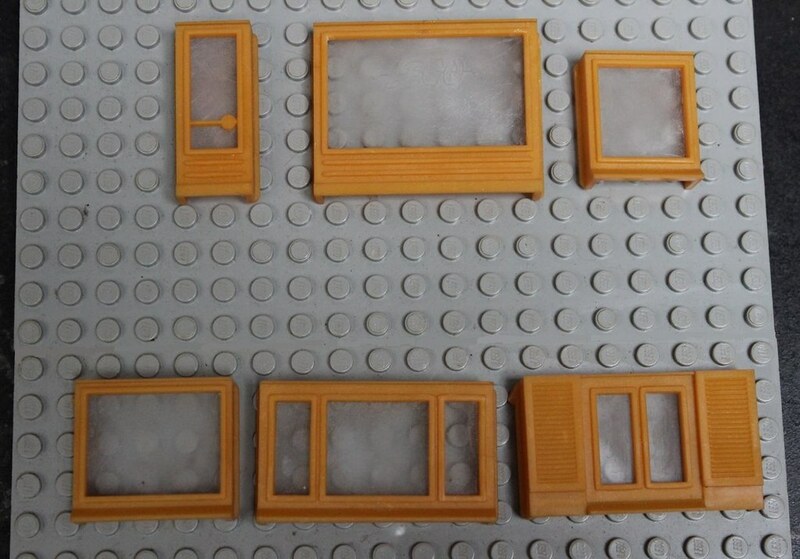 This very small set was sold mainly in Scandinavia, and contained a unique 10x10 gray baseplate with cross supports underneath. Rare 700h 10x10 gray baseplate (with bottom cross supports) only found in this 005 Basic Set. 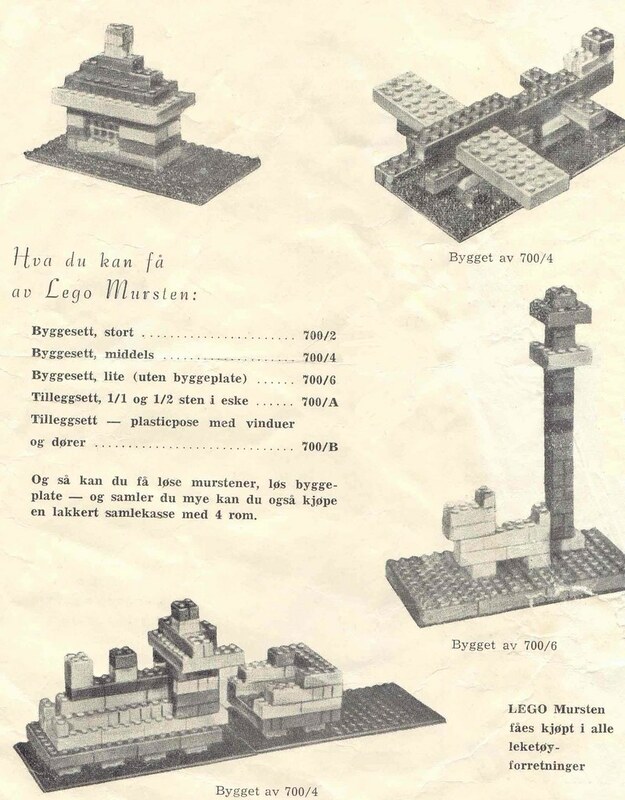 Getting back to the 1950s Norway....A/S Norske LEGO (as seen in an earlier advertisement)... was forced to change their name to A/S Norske LEGIO... this happened about 1954-55. 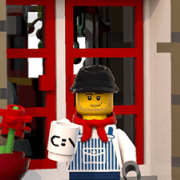 And the reason for this was because TLG Denmark was probably not happy with the Norway LEGO licensee for putting the word "LEGO" on their "Mecline" sets and catalogs. 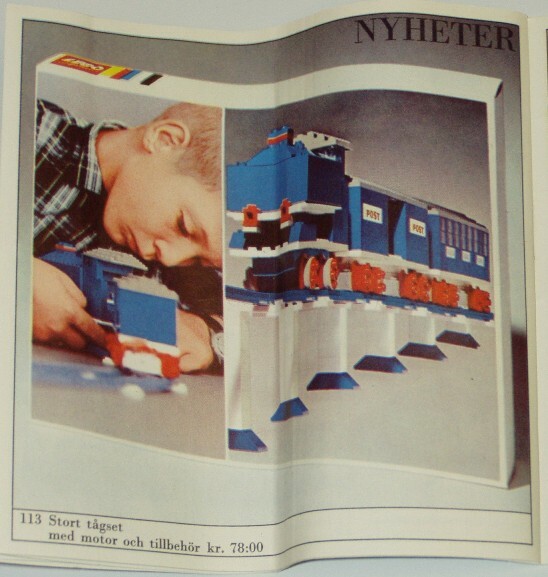 Here is one side of a 1956 Norwegian catalog that shows both LEGO products (mainly in the area with the blue lines)... and Mecline, another building system toy... that as this catalog image shows... also had vehicles that looked similar to the LEGO ones. Here is a group of the (1954-56) tall classic windows that were produced for Sweden (likely produced in Norway, since the Billund Archives are not aware of this color). These rare Swedish windows would probably sell for about 80 Euro each... with the rarer green Norwegian ones selling for 100 Euros each. Also produced (from Denmark) were the tall classic windows in white, blue and dark blue), with the dark blue shade being the rarest. 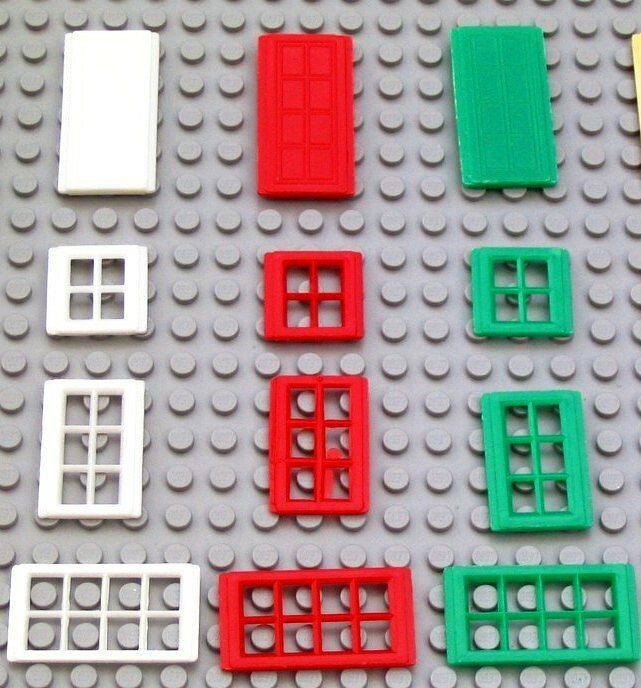 Then in 1956 with the discontinuing of the slotted bricks... all of these window types and colors were discontinued. 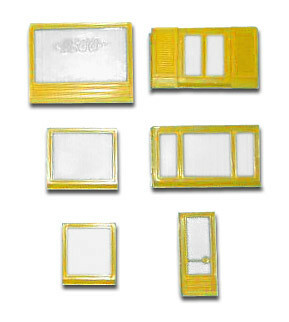 What came out in 1956 was the regular classic windows/doors (produced until 1986)... mainly just in red and white colors. And so very timely too!! 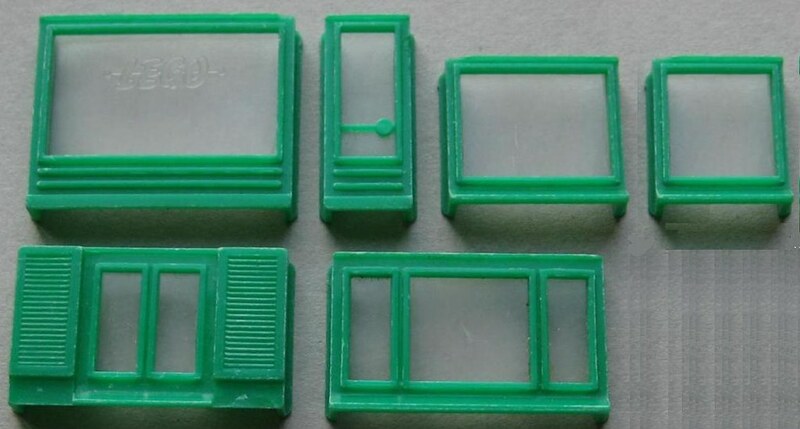 Here's some new (old) 1955-56 Norwegian windows found within the past year.... in green!!! And here's some from Sweden found only in the last few months.... in ORANGE!!! And since we're discussing Scandinavia... the flags of Scandinavia all had a cross design... just in different color combinations. The earliest flags were introduced in November 1957. 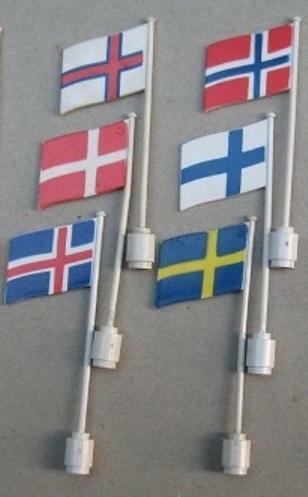 And there were only 4 Scandinavian flags at that time... for the 4 Scandinavian countries that were selling LEGO... Denmark, Norway, Sweden and Iceland. For some strange reason the flag of Finland was not produced right away (even though the USA and Britain flags were produced, but there was yet no LEGO sales in those countries). By 1960 however, the Finnish flag became the 15th LEGO country flag, and stayed in production for as long as LEGO country flags were produced. And speaking of Scandinavian countries... there is one very small island chain that lies between Norway, Iceland and Scotland called the Faroe Islands. This small group of islands with a population of about 50,000 is an autonomous part of Denmark. Faroe Islands (upper left), Norway (upper right). Denmark (middle left), Finland (middle right). Iceland (lower left), Sweden (lowere right). 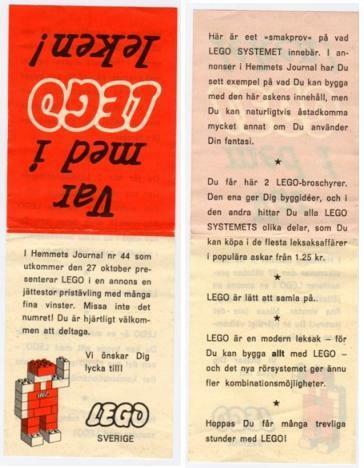 In 1959 a Swedish magazine known as Hemmets Journal had a LEGO promotion. The promotion involved sending away for a LEGO promotional set, and being able to build the models shown in the Hemmets Journal. There were at least 3 models... with each model numbered on the side (#1, #2, #3, etc). Here is the brochure for Hemmetts Journal #44 on Oct. 27, 1959. The problem is that since I've never been able to locate any images from these Hemmets Journals, I have no clue what the models each little pack is supposed to build!! And then there is the SAS Scandinavian Airlines promotional set of the 1960s. 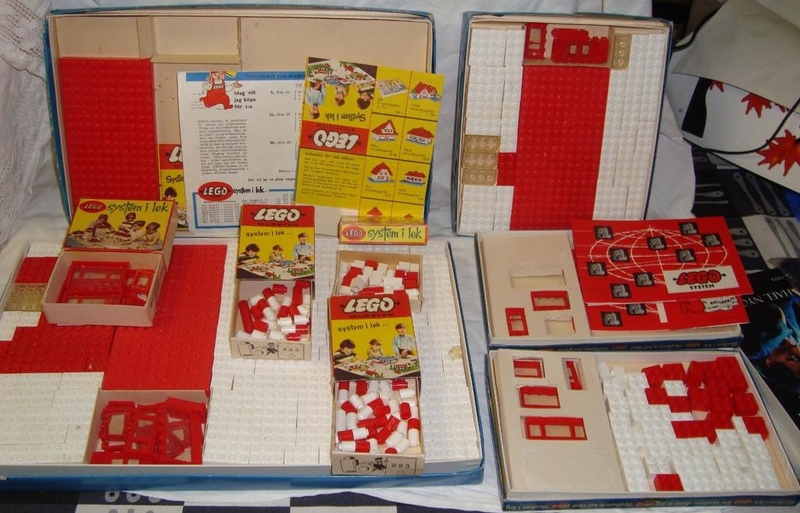 This flat set contained smaller boxes with just LEGO bricks inside each smaller box. SAS Airlines was the major hub for Stockholm Sweden (the headquarters), Copenhagen Denmark, Oslo Norway, and Helsinki Finland. 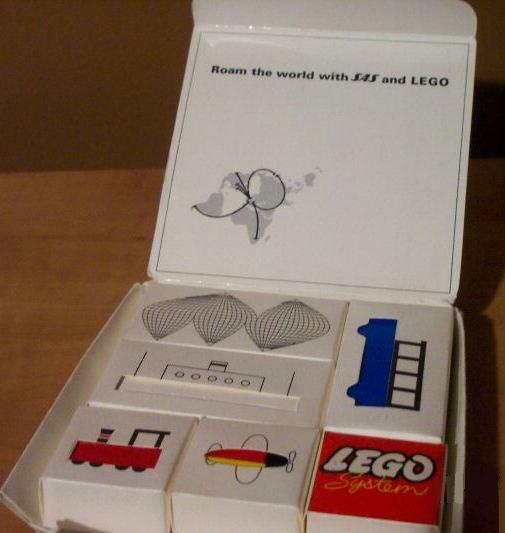 This small box of LEGO was given to children on SAS flights in the 1960s. 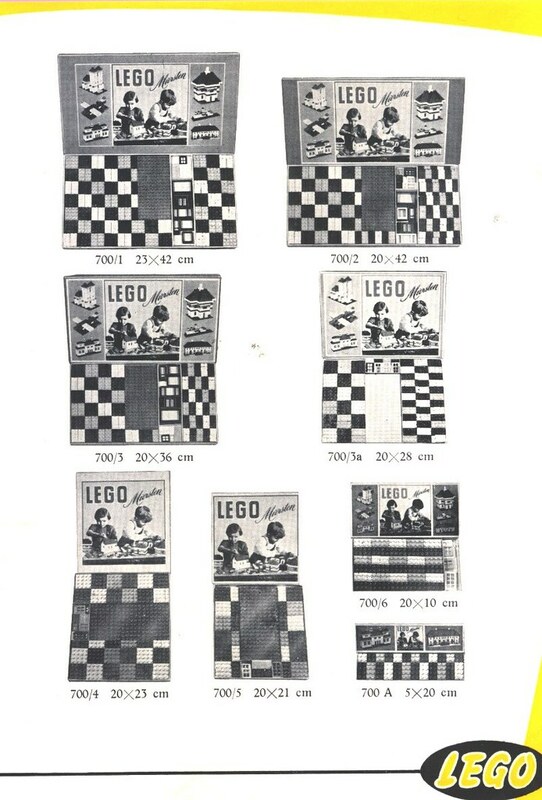 These last few images were from my LEGO DVD/download chapter on LEGO Promotional Sets (over 100 sets from 1955-99 shown in this chapter). More Scandinavian LEGO from my LEGO DVD/download coming over the next few days. I love your updates! Keep em coming! Side track: I'm almost (but not completely) sure that I had one of those promotional "train starters" (I was 12 years old at the time), but I can't verify. Thanks Anders..... it was 4AM when I typed that... and it was a typo! But I went back and fixed it! 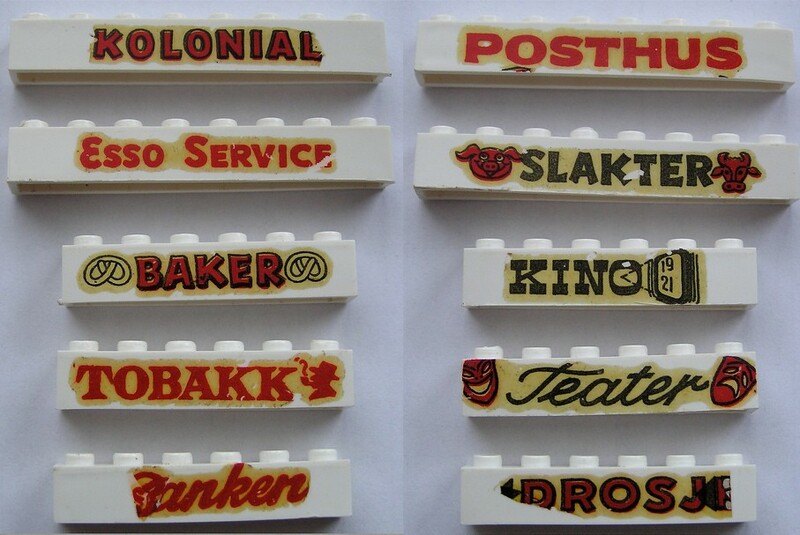 And the first printed bricks from Norway were water decals, not embossed bricks... the "DROSTE" brick is missing the last "E", because the decal folded back over itself, obscuring the "E"... these date to about 1955-57. And then there's the printed bricks of Germany/Austria/Luxembourg, Switzerland, Belgium, France, Italy, Netherlands, Denmark, Britain/Ireland/Australia and USA/Canada. TLG never produced a separate unique set for Portugal (LEGO sales started in 1957), Spain (LEGO sales started in 1965) or Japan (LEGO sales started in 1962).... as found in my LEGO DVD chapter 48. However... the Italian TEATRO... also works for Portuguese and Spanish! With THEATER for Germany/Austria, USA and Canada, THEATRE for France and Switzerland, GRAND THEATER for Belgium and Netherlands, and TEATER for Denmark, Norway and Sweden, and TEATTERI for Finland. 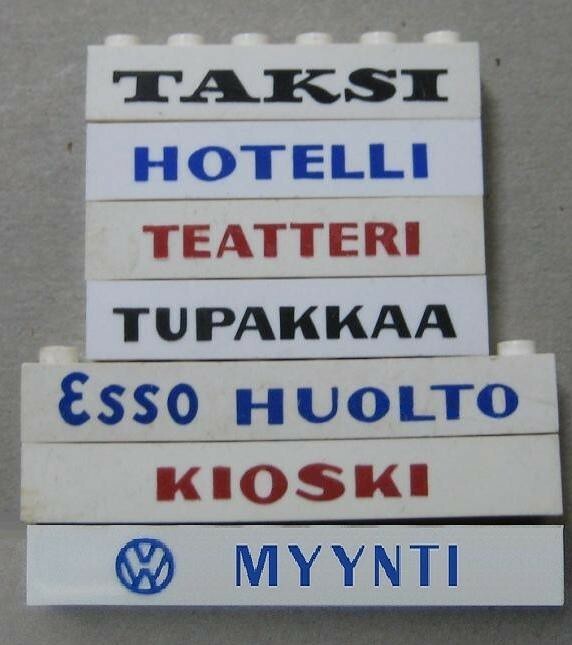 And finally some printed bricks are know as "International"... such as GARAGE, ESSO SERVICE, HOTEL, and KIOSK. 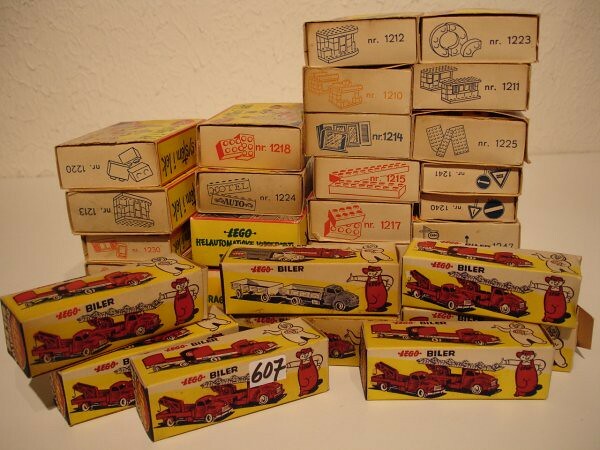 Here are some 1956-59 Swedish LEGO Basic Sets and Spare parts packs. 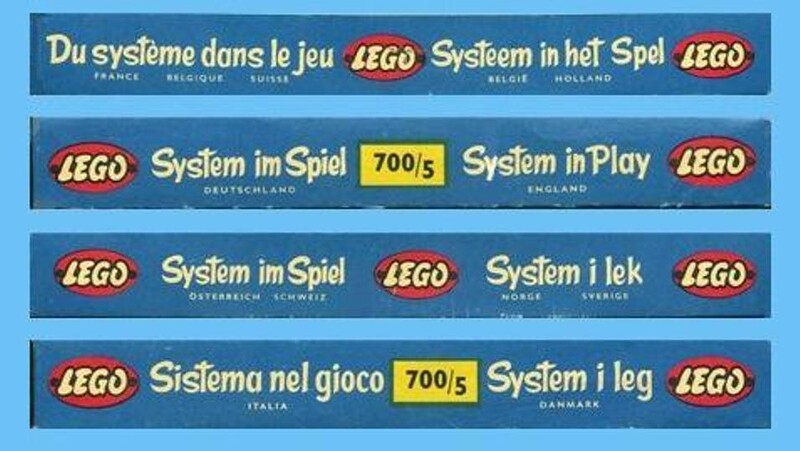 The boxes would be nearly identical to Norwegian ones, since "System i lek" is the same "System in Play" in both languages (it would be "System i leg" in Danish). 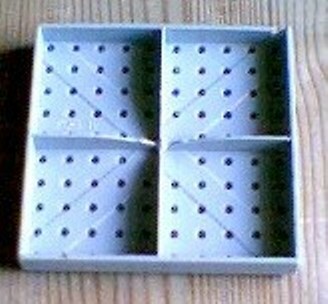 The largest box is the 700/1 Basic Set, the one standing up (left) is the 700/2, the standing right is a 700/5, and the 2 lying down boxes on the right (dating later) are both 700/6 boxes. Oddly the higher the 700/x number, the smaller the box. 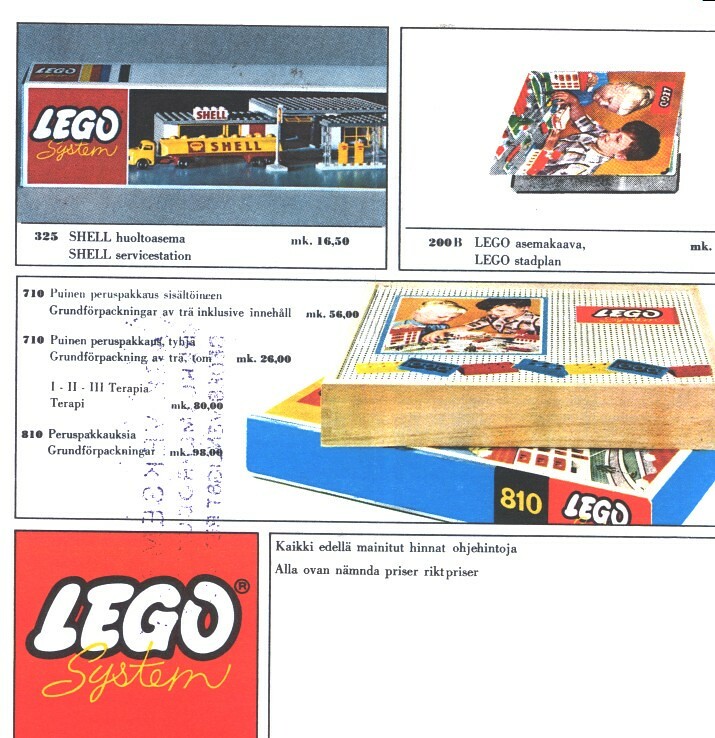 There is a large (white) 1956 Swedish catalog shown here, an yellow/red 1958 Swedish catalog, and a red 1958 brochure that talks about "Cellidor" (Cellulose Acetate), the plastic that LEGO is made of back in the 1950s. By 1957 TLG decided that with the Denmark, Sweden, Norway, Germany, Switzlerland and Netherlands online... with Austria, Belgium and Portugal coming online in late 1957... that too many different language boxes was very impractical. 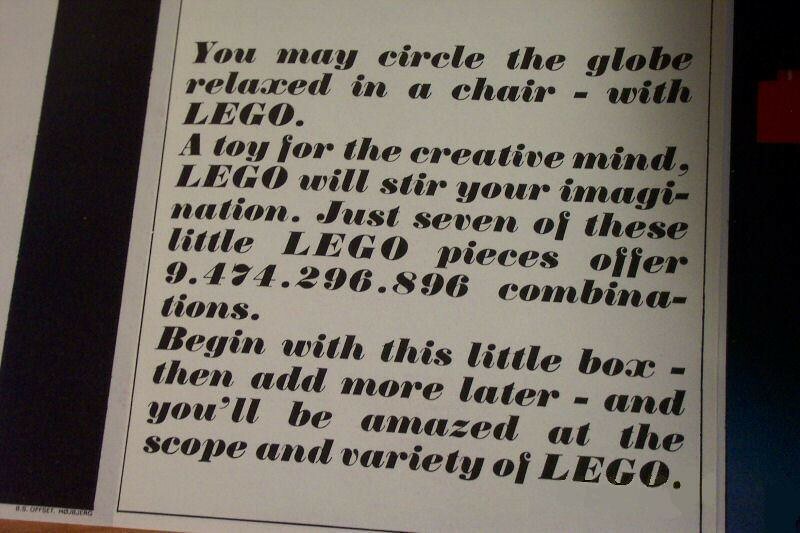 So TLG decided to Switch from the local languages to the international "LEGO System" in 1957. That's why the Swedish boxes above are of both the earlier local language (Swedish) type and the international type. Now... you would think that this all makes sense, and TLG started LEGO boxes in the local languages, and then by 1958 or so they switched to new box designs in local languages... and afterwards switched to using the international "LEGO System". 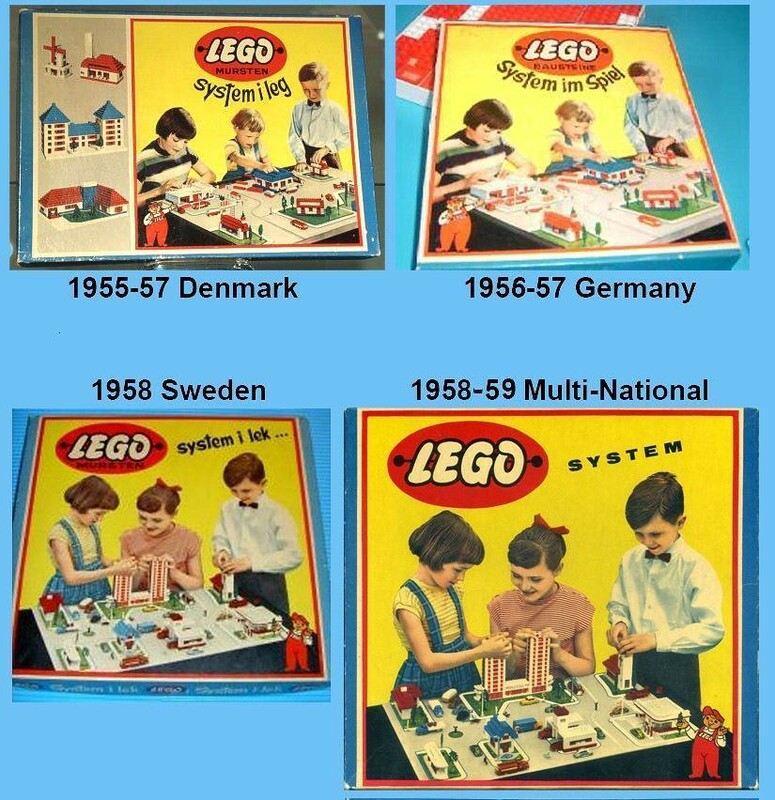 What this shows is that all the way to 1960 (when new set designs came out)... the Danish market continued to use the local Danish language LEGO boxes with "System i leg"... instead of switching over (like all other countries)... to "LEGO System" back in circa 1958. (note: when Portugal started sales at the end of 1957 they started with LEGO System... ditto for Finland in 1959). Again, most of these images are from my LEGO DVD/download... with a few new ones to be added in the next update. Thanks again for the info, Historian! Wow, that's amazing. I never got freebies like that when I flew as a kid (which I did a lot, as an Air Force brat whose family moved a lot to all the places my dad got stationed). Blondie-Wan... to Americans it is rather appalling to think of TLG using tobacco or cigarette signage. In continental Europe many stores sold tobacco and candy together in the same store. So finding signage for tobacco is not that strange for Europeans. The printed bricks TLG used for Germany/Austria/Luxembourg were "TABAK", for France it was "TABAC", for Italy it was "TABACCHI", for Netherlands it was "SIGARETTEN", for Denmark it was either "TOBAK" or "CIGARETTEN". For bilingual Switzerland it was either "TABAK" or "TABAC", for bilingual Belgium it was either "SIGARETTEN" or "TABAC". For Britain/Ireland/Australia (British LEGO Ltd.), and USA/Canada (Samsonite LEGO)... there were no tobacco signs produced.